The purpose of this web site is to promote Freemasonry in general and our Lodge in particular by means of the world wide web. Worshipful Brother Ben Marsh JP. Past Grand Deacon, Deputy Provincial Grand Master in Charge. In the mid 1940’s Malvern was a town that was made up of several smaller townships with sharp divisions between the different parts. Once famous for its water cure it was also noted for its Annual Festival and for its educational establishments. The town expanded dramatically with the arrival of the Royal Radar Establishment, and as nationally, the interest in Freemasonry grew also and such was its demand that Lodges became oversubscribed and new ones were founded to accommodate them. In Malvern this resulted in the Consecration of the Malvern Hills Lodge. From its inception the ritual of the Lodge has been most important and was, from the very start, prescribed originally by those Members who founded the Lodge. There have been alterations to the Ritual over the 50-plus years since the Consecration, some of which were specified as the result of decisions made by the Lodge Committee whilst others (mainly concerning the wording of the Emulation Ritual) have come about as the result of edicts from Grand Lodge and still others by usages which, by now, have become a traditional part of the Workings of the Lodge. It is, therefore, apparent that the way in which procedures are now carried out must be described as “customary”. Brethren of the Lodge have assembled a formal written record of what should take place during our Ceremonies. It has been completed with the help of earlier records as well as by using the undoubted powers of memory of some of the older Past Masters of the Lodge, not to mention the Preceptors, past and present, of the Lodge of Instruction without whose efforts many of the established customs of the Malvern Hills Lodge would have been lost in the mists of time. Also published, as a separate document, are the Inner Workings for the Installation Ceremony, the original master copy being lodged with the Preceptor of the Lodge of Instruction. Brethren wishing to visit our Lodge should contact our secretary to arrange this, and the general public are welcome when the Masonic Hall is open during civic week. Freemasonry in Worcestershire is well recorded from the 18th Century. From the beginning of the 19th Century it is known that there were freemasons in Malvern who were members of lodges in Worcester. In 1867 the first lodge was consecrated in Malvern. It was called The Royds Lodge after the Provincial Grand Master of the time, Albert Hudson Royds, who lived at Ellerslie in Abbey Road. The lodge met at The Belle View Hotel for several years before moving to The Imperial Hotel (now Malvern Girls' College) and in 1879, to the former hydropathic bath house in College Road which, now a private house, is still called 'Royds Lodge'. In 1911 Royds Lodge obtained a lease of the present Masonic Hall in what had been part of The Belle View Hotel. The first meeting was held there on the 9th January 1912. The Lodge Room had been the hotel's billiard room containing three tables and the dining room appears to have been the commercial dining room of the hotel. The room has changed very little in over a century. Many of the furnishings are very old. The Master's chair is believed to be 16th century and was given in 1872. 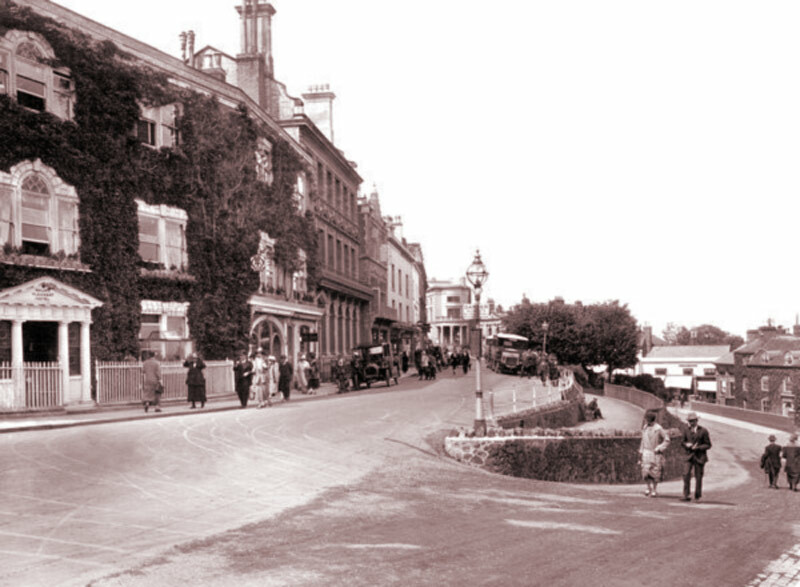 The pedestals were obtained from Warwich House, the department store in Wells Road. The upholstered benches were originally used in the billiard room. Belle View Terrace in around 1925. The lodge entrance is located just behind the rather splendid car in the centre of the photograph that is parked directly outside the building currently occupied by Lloyds Bank. Our Installation meeting is particularly recommended to past masters. 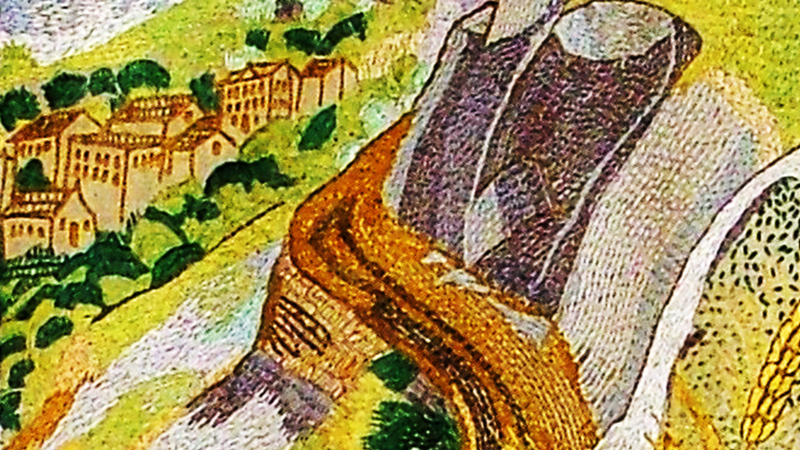 The main panel of our banner depicts the Malvern Hills with a view towards the town from somewhere near to Ivy Scar Rock. With the many springs on the hills it is highly possible to find a flow of water near to an ear of corn, signifying abundance and the ‘All Seeing Eye” observes throughout. The main panel is surmounted by the Lodge name and sub-mounted by the Lodge number, with dark blue quarters. 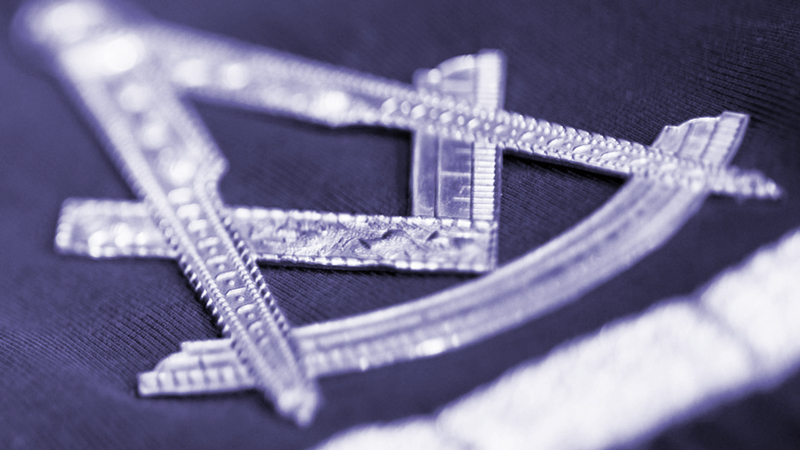 Beneath the Lodge number is a triangular dark blue panel containing a square and compass in gold. There is a gold frieze to the bottom of the banner. 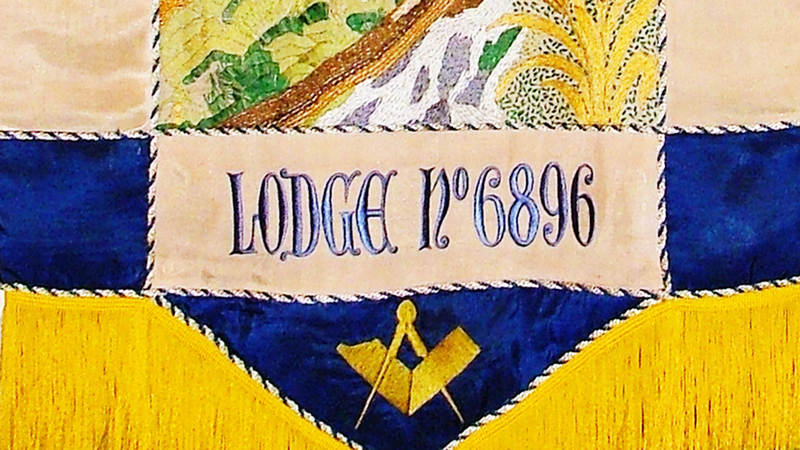 The content of the web site was approved by the Lodge Committee on 18th February 2009. It was submitted to Provincial Grand Lodge and to United Grand Lodge for their respective approvals, which was received on 16th June 2009. Containing the finest collection of Masonic items in the English constitution, other than that belonging to the United Grand Lodge of England itself. Morgan Lodge was sponsored by the Malvern Hills Lodge and is therefore our Daughter Lodge. The Lodge was formed primarily for those Freemasons that also own a Morgan sports car, which are still made in the town. This site provides some background to the place where Malvern based Masonic orders meet. Meets on the 3rd Thursday of the month October to May, see the Royds web site for further details. Meets on the last Saturday of the month September to April, except December which is on the 3rd Saturday of the month. Meets on the 3rd Saturday of March, June, September and November. See Morgan web site for further details. Meets on the second Wednesday in May, September and November and the first Wednesday in March (Installation). The Worshipful Master would like to thank all those that attended the various functions held during his term of office, those who generously donated prizes for raffles, or their time, and those that contributed even though they were unable to attend all, or some, of the functions. Your generosity has meant that the following charitable donations have been made. Time and space limited free road-side parking is available at the front of the Masonic Hall on Belle Vue Terrace; on the A449 in Worcester Road and Wells Road. Please note that it can be difficult to find a parking space during office hours. There are several pay-and-display car parks in the centre of Great Malvern, including one situated to the rear of the Masonic Hall, which is accessed by St Ann's Road, which is by the Unicorn public house. Please be aware that local parking charges apply at all times. There are two train stations in Malvern, Malvern Link and Great Malvern. The nearest station to the Masonic Hall is Great Malvern. Both railway stations are on the main London Paddington to Hereford line. Rail information and train timetables can be found at the The National Rail Enquiries website. Taxis are available from both Great Malvern and Malvern Link train stations. We will always respect the privacy of individuals who browse our website and leave contact details with us. Please read this policy carefully as it contains important information about what to expect when we collect personal information about you and how we will use that data. Malvern Hills Lodge does not track your activity as an individual. Any information you submit to us, either through this website or through any other means such as email, telephone or letter, will be regarded as confidential, and will not be passed to any 3rd party. We gather the information to allow us to process your application for membership of the Fraternity. Your information may be passed to the appropriate officer for action. Any information that you provide will be stored and/or disposed of in accordance with applicable data protection legislation. • we will use all reasonable efforts to safeguard your personal information and to protect your details against third party access or modification – we do not rent, sell, or share personal information about you with any other organisations. You should be aware though that the use of the internet is not entirely secure and for this reason we cannot guarantee the security or integrity of your personal information which is transferred from you or to you via the internet. • we allow you to specify the level of future contact that you will receive from Malvern Hills Lodge and we will respect your wishes. You have the right to request a copy of the information that we hold about you. If you would like a copy of some or all of it please use our contact form. We may make a small charge for this service. We want to ensure that your personal information is accurate and up to date. If any of the information that you have provided to us changes, such as a change in your postal or email addresses, or if you do not wish to progress or renew membership, please let us know by using our contact form. You may ask us to correct or remove inaccurate information. Any cookies are used only to ensure proper running. They are not used for tracking purposes, just to hold site information for the duration of your browsing session. We use Google Analytics to provide statistics on website traffic – see below for the Google explanation. We do not use 3rd Party / Tracking / Advertising cookies. If you do not know what cookies are or would like more information, the organisation aboutcookies.org provides further information, including how to delete cookies in your browser. ©2018 - Malvern Hills Lodge, No. 6896. All Rights Reserved.